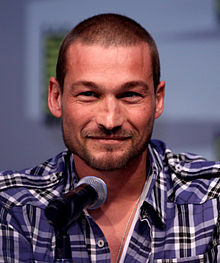 Andy Whitfield (17 October 1971 – 11 September 2011) was a Welsh-Australian actor. He was best known for his leading role of Spartacus in the Starz television series Spartacus: Blood and Sand. He was born in Amlwch, Anglesey. Whitfield died from non-Hodgkin lymphoma on 11 September 2011 in Sydney, New South Wales. He was 39. He was outlived by his wife and their two children. ↑ "Spartacus star Andy Whitfield, 39, dies in Sydney". news.com.au. 12 September 2011. Retrieved 18 April 2014. Wikimedia Commons has media related to Andy Whitfield. This short article about an actor or group of actors can be made longer. You can help Wikipedia by adding to it. This page was last changed on 15 August 2018, at 06:29.